What are the misspellings for flag? 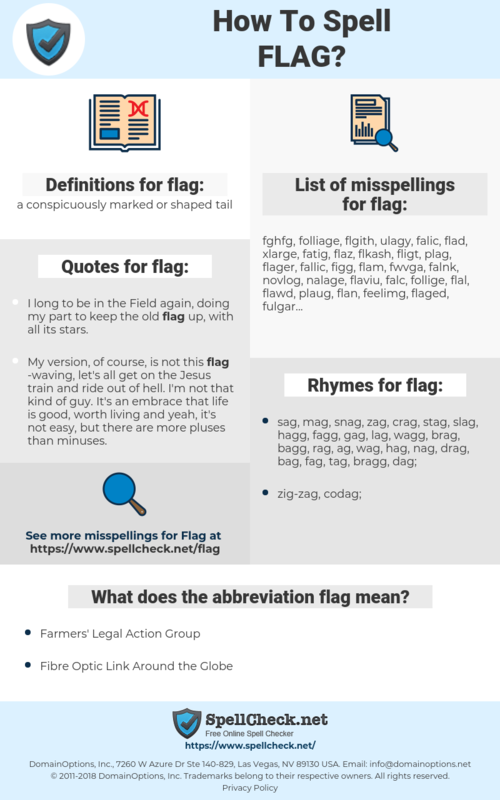 What are the common mistypes for flag? What does the abbreviation flag mean? What are the usage examples for flag? What are the quotes for flag? What are the rhymes for flag? What are the translations for flag? 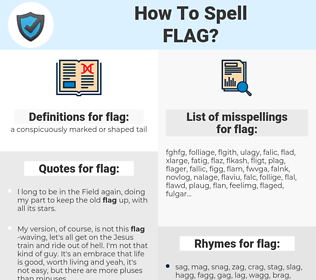 What are the common typos for flag? This graph shows how "flag" have occurred between 1800 and 2008 in a corpus of English books. I long to be in the Field again, doing my part to keep the old flag up, with all its stars. My version, of course, is not this flag -waving, let's all get on the Jesus train and ride out of hell. I'm not that kind of guy. It's an embrace that life is good, worth living and yeah, it's not easy, but there are more pluses than minuses. 旗, 国旗, 船旗, 帜, 旗子, 旂, flaff. signaler, drapeau, pavillon, faiblir, ralentir, signalement, fanion. nachlassen, kennzeichnen, markieren, Platte, Fahne, abbauen, Option, fließen, Kennzeichen, Markierung, abflauen, stocken, Flagge, Impressum, Fliese, erschlaffen, Merker, Fähnchen, Steinplatte, Schwertlilie, Lichtabdeckschirm, beflaggen, welken, Merker setzen, müde werden, erlahmen, mit Steinplatten belegen. 旗, フラグ, フラッグ, のぼり, 標識, 一旗, 幟, ひとはた, 旌, 旗幟, 幡.
assinalar, sinalizar, bandeira, desfalecer, embandeirar, bandeirola, balsão. indicador, marcar, estandarte, disminuir, decaer, marcador, insignia, bandera, pancarta, emblema, pabellón, flaquear, desfallecer, languidecer, banderín, enseña.